We’re producing an event during MJ Biz Con to bring all the fabulous ladies of cannabis together in one 2300 square foot suite at the Elara Hilton! This is the second annual Women Wednesday! 250 lucky women are registered with a waiting list on Eventbrite. Cannabis Businesses: If you support women in cannabis, we want to speak with you. We’re seeking generous sponsors to help make this event possible. Funds raised will contribute to operational costs as well as a business plan to license a female owned-and-operated dispensary. Select Your Sponsorship Package Before They’re Gone! Highlights of the event! Epic views from our suite where we’ll be sipping champaign and toasting the success of MJ Biz Con in Vegas for 2018! Premium sponsors will be featured on our step-and-repeat banner where we’ll be capturing the moment thanks to our fabulous photographer. And we’ll be whoopin’ it up with tunes from our LIVE DJ! 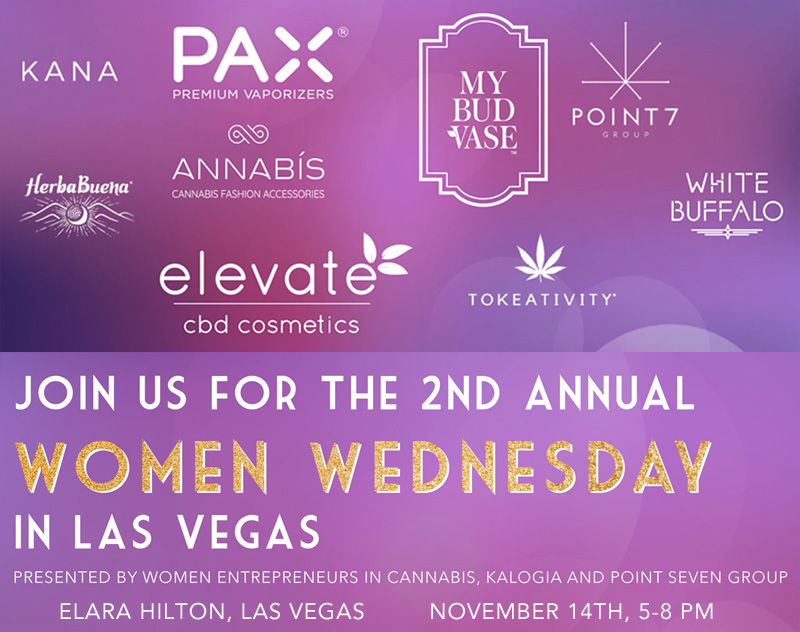 Brought to you by Women Entrepreneurs in Cannabis, Kalogia & Cannabis Women’s Empowerment Society, Point Seven Group, and White Buffalo. This is your opportunity to share your product or service with the elite of female owners and operators in cannabis from around the country and the world. Get in touch today to secure your sponsorship package before they are all GONE! Packages may increase in prices we get closer to the event, so don’t wait. Call Courtney at 424-259-2261 or use the form below to send us an email.